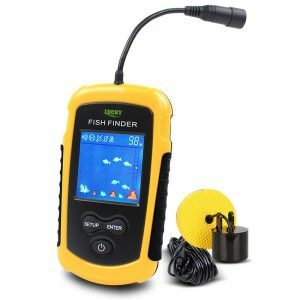 What is the best fish finder GPS combo? Choosing the best fishfinder GPS combo can be a difficult task. The market is flooded with hundreds of models to choose from. Furthermore, different manufacturers offer different specifications and features. It can be an absolute minefield trying to locate a suitable scanner for your fishing adventures. You have to think about a dizzying amount of aspects such as screen size, transmission power, cone angle, and the transducer for example. How can you realistically keep track of all this and try and make an educated decision? We know just how difficult it can be – we know selecting a suitable appliance can give you a headache and result in stress and frustration. Don’t worry, help is just a short read away. We have expert knowledge of these instruments and know everything there is to know about angling and the associated gear. We can tell you useful details about GPS scanners and what features to look out for. By the time you have read this guide, you will be able to choose the best fishfinder GPS combo with ease! Finding water depth – When sailing or kayaking on water, you must be aware of the depth. If you do not know the depth, you could crash into rocks lying under the water surface. Moreover, you could run aground if you sail into waters that are too shallow. 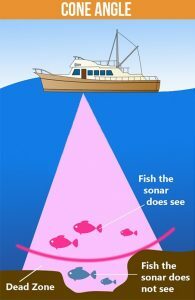 By using a sonar, you can avoid these situations. Furthermore, certain sea creatures may swim/live at certain depths and you can use your scanner to locate suitable depths where these creatures could be. Finding the best location – Locating where the fish are is the main idea of this device. If you had no such device, you might spend fruitless hours without a single sign of life underwater. Using a GPS eliminates this factor and sends you directly to where the best catch opportunities are. You should be able to turn the item on, look at the display, and sail straight towards the action! Quantifying the number of fish – Aside from knowing where the best catches are, you want to be able to quantify the number of catches too. A scanner will give you accurate information about fish quantity. You will not waste time sailing to locations that only have a couple live catches. You can just head straight to the areas that have full schools of fish! This makes your trip much more enjoyable and fruitful. Finding water information – Aside from the water depth, scanners can give you accurate information about other water qualities. You can obtain useful information such as water temperature and wave speed. Knowing the water temperature can help understand movement patterns and guess where the fish will likely be as some sea creatures prefer colder temperatures for example. Knowing wave speeds and patterns can help with sailing – you can spot potential danger and position your vessel accordingly to avoid any hassle. These are all excellent benefits that give you a valid reason to purchase the best GPS fishfinder combo. When choosing the best fish finders with GPS, also consider the type of scanner. This device comes in various models such as standalone, combination and networked. 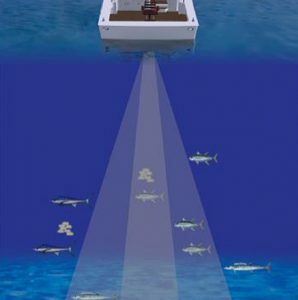 A standalone model is a dedicated scanner that has one purpose – to locate marine life. A combination model usually has scanning capabilities but also has advanced GPS navigation information too. Finally we have a networked system which is the most complex model. A networked scanner can connect to external sources using WiFi or Bluetooth and provide the most advanced information and detailed navigation charts. A transducer is the most important aspect of a fish finder. Without a transducer, your device simply can’t function. What does a transducer do? It is the component that emits the sonar waves into the water. The transducer sends out sonar waves in a cone. These waves travel down into the water until they hit an object (such as a fish) – once they hit an object they bounce back which is used to form the image. As standard, the best GPS fishfinders will come equipped with a transducer that is more than adequate or you can buy a separate transducer that has greater scanning capabilities. In most cases this is a waste of money as the default accessory will usually suffice. A transducer can be mounted on the transom of your vessel or poking through a special hole in the hull. The transom method is the cheapest and easiest. The in-hull mounted alternative is more expensive but provides a more accurate scan. You must also consider the material as transducers are available in bronze and plastic housings which can affect the quality. Finally, look at the type of scanner – standalone, combination or networked. The type you choose could affect which transducer you choose. Standalones have simple scanning capabilities. Combination, on the other hand, allows you to scan, and also offers basic navigation functions. Networks are the most advanced and can connect to external sources over the Internet. How much transmission power, and what frequencies? 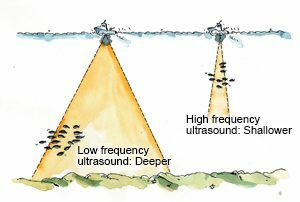 Frequency – Frequencies relate to the transducer and the quality of the sonar beam. Top rated fish finders with GPS have several frequencies to choose from which gives you greater flexibility and allows you to operate in different water conditions. In most cases, common frequencies are 200kHz, 192kHZ, 83kHz or 50kHz. As a rule of thumb, the larger the frequency, the more information you will be able to see. Higher frequencies work better in shallow waters, whereas lower frequencies work better in deep water. We advise looking into a fishfinder GPS combo that has dual or multi-frequency capabilities. If you limit yourself to a single frequency, your scanner may not be suitable for a variety of water conditions. Using a multi-band scanner, you can use it in any water condition such as lakes, open seas, and rivers. Power – Power, frequency, and transducers usually go hand in hand. A transducer can operate on a number of frequencies. It will also have a power rating. This is measured in Watts and determines how strong the sonar beam is. 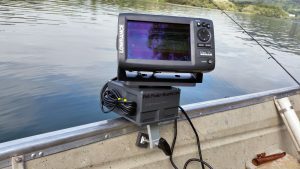 Power is usually listed in a fishfinder GPS combo description as either RMS or PTP. The main point to remember is that PTP is 8x greater than RMS. Some manufacturers may display RMS, others may display PTP – some may even show both. A simple formula to remember is that for 100W RMS and 50kHz you get a depth capability of 400ft.The greater the power rating, the lower the depth you will be able to see with your scanner. The power rating you choose will depend on what waters you typically sail in. If you mainly angle in rivers and shallow water, you will not need a high power rating for example. Alternatively, if you sail in large bodies of water, a higher power rating is ideal. The main point of a scanner is to provide a visual display of what is underneath you in the water. 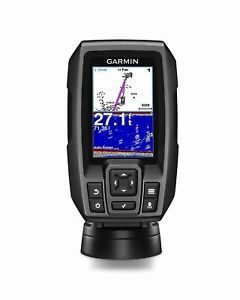 What is the point of purchasing a GPS fish finder if the display quality is poor and you can’t understand what you are looking at? 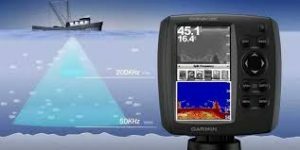 You must have a high quality display with a fantastic resolution – by doing so, you can put your fishfinder to proper use. Screen Resolution – In screen resolution terms, bigger is better! The larger the display, the more you can see and hopefully the higher quality picture you will see. Pay attention to the size of the screen and its resolution. The size is usually measured in either inches across the diagonal, or pixels across the height and width. For example a screen could be 800px x 600px, or 7” diagonally. Resolution relates to how many pixels are shown within the screen dimensions. You want a high resolution as this will give a much clearer display. Color vs. Black & White – Some older models may still have a black and white display. Modern devices will have a full-color display. 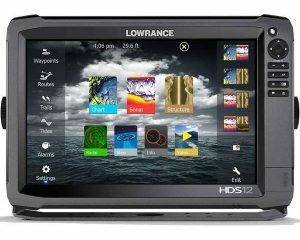 We strongly advise purchasing a touch screen GPS fishfinder with color display. Why even consider using a black and white screen when color screens are much more common and widely available? When choosing the best fish finder, the cone angle is extremely important. This factor affects the overall quality of your sonar scanning and display. Think of the cone and beam as a fixed point starting from the transducer that travels into the water. This beam spans out in a cone shape and gets wider. The sonar beams travel downwards and as it hits an object it bounces back creating the display image. Consider the cone angle and materials when looking at your fishfinder GPS combo. Cone angles can vary – some may be narrow and have limited vision, other may be much wider and offer greater display potential. An ideal cone angle is between 16 to 20 degrees, this angle range gives you a great field of view. Cone angles can range from as little as 6 degrees, up to 60 degrees. Bear in mind that in deep water, a wider angle will lose quality quicker. If you want a variety of angles, you could consider purchasing a dual or triple band device for flexibility. Portable – Portable devices do not usually have any fixture. They may have a basic plastic clip but will not have any mounts that can be secured to a boat. A portable scanner is suitable for light craft or even stationary angling on the side of a lake. If you are using a kayak or paddleboard, a portable device is the best choice for your fishfinder combo. Mountable – Mountable device are larger and have a reinforced mount. This will allow you to secure your scanner to your vessel and have it in a fixed position. A mountable scanner is suitable for larger vessels such as yachts and sailboats. If you regularly use the same vessel or even own your own boat, a mountable scanner is ideal for the best fish finders with GPS. Finally, consider the GPS system your device features. Some devices contain both scanning capabilities AND GPS navigation. Others may only contain scanning capabilities. Think about where you fish and if you would benefit from navigation – if not, a standalone scanner could be preferable. Alternatively, if you are on large lakes or open water, you could use the best fish finders with GPS to help find your way around. Aside from navigation functionality, consider fishfinder combos with advanced GPS. Some devices have multiple GPS frequencies or channels to give you more accurate data. Look at what GPS system is used and how fast it can operate. Picking a fish finder and GPS combo for your fishing boat doesn’t have to be rocket science, but there are a lot of options out there. Ranging in size from small portable units that look just right on your kitted-out sea kayak to monster wide-screen displays that look great on your offshore yacht’s flybridge, here’s a list of our favorite units. 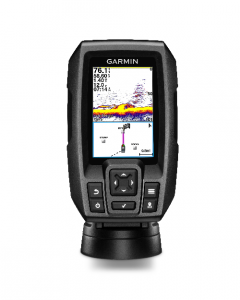 Garmin manufactures some of the best fish finder GPS combo units. The 1040xs is a multi-function display capable of displaying upgradable nautical charts, marine radar, and numerous types of sonar. This is a big display made to be permanently mounted on larger vessels. Garmin makes electronics and navigation equipment for marine, aviation, and personal use. For boating applications, they also make radar units, sonar transducers, and a host of other cutting-edge technologies. If you have a large vessel and need a complete solution that will network with all of your onboard systems, Garmin displays cannot be beat. This is an older model that lacks a touchscreen, but many boaters still prefer hard keys. The 1040xs is now an excellent deal for a great unit. Garmin’s 1040xs can be installed and upgraded in many ways, so it’s perfect for any larger boat looking for a GPS fish finder. Its 10-inch screen cannot be beaten, and we love Garmin’s marine charts. 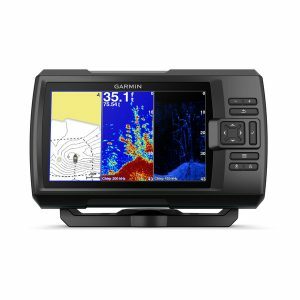 Garmin’s echoMAP 73SV is a smaller multi-function display designed specifically for fishing boats. It has a much smaller footprint than their 1040xs fish finder GPS, yet it still works with the same wide range of expandable Garmin transducers. Garmin’s echoMAP series of units feature flush-mount or bail-mount screens that interface with a variety of onboard transducers so you can customize your sonar to your fishing needs. Another older model that still offers impressive functionality, the echoMAP 73SV is specifically made for fishermen and works great with many of Garmin’s sonar units, including the popular SideVü technology that uses a wider beam to see more of the bottom. 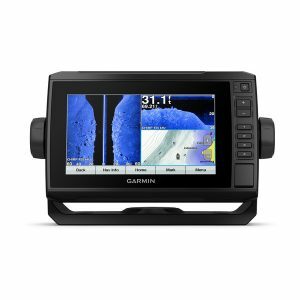 If you have a smaller boat and are really just looking for the best fishfinder GPS combo, Garmin’s 73SV saves you a few bucks and looks fabulous. 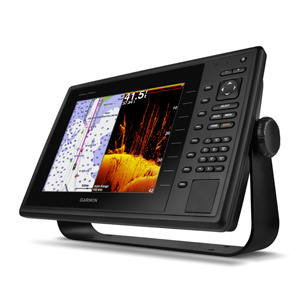 Simrad’s NSS7 evo2 is another large multi-function display designed for the bridge of a yacht. As a standalone unit, it can handle pretty much any system you have on board, be it fancy sonar transducers, broadband radar, or even autopilots. 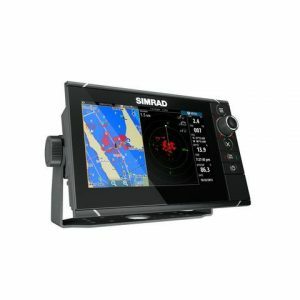 Simrad manufactures a wide range of electronics for the yachting industry, from GPS chartplotters to radios and transducers. The NSS7 evo2 is designed to be just one part in a larger system of devices onboard your vessel. When used alone, it is an impressive chartplotter and the best GPS fishfinder. Pick and choose the right sonar transducer for you and your boat, and you’ll then have a fish finder that will make the other anglers on your lake green with envy. If you run a big boat, or your vessel already has a good backbone of NMEA 2000 devices, Simrad’s NSS7 evo2 display is a great addition. If you’re just looking for basic fish finders with GPS to put on a smaller vessel, then the NSS7 evo2 is probably overkill. Like the 73SV, the CHIRP 52cv comes from Garmin’s echoMAP series of fishfinder GPS combo units specifically for anglers. 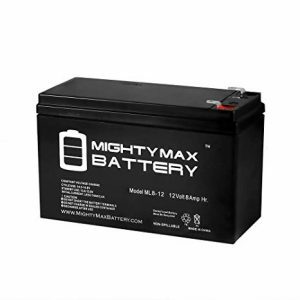 This is an even smaller unit more appropriate for bass boats and john boats. Garmin’s GPS fishfinder combo models come in all shapes and sizes, from 3.5- to 10-inch displays, with or without navigation charting, and with or without CHIRP sonar technology. The CHIRP 52cv is one of the smallest Garmins on our list that features chart plotting navigation and CHIRP sonar technology. This is the perfect sized unit for most fishing boats in the 15- to 30-foot range since it offers all of the tech you want, but doesn’t take up too much dash space. If you’re a fan of Garmin’s products, the CHIRP 53CV is an excellent value for a mid-sized fishing boat. CHIRP technology is a must-have in our opinion, and if you live in coastal areas and need charts too, then this unit is a great choice. Garmin’s Striker 4 is a super compact fish finder GPS combo that will look as at home on a kayak as it will on a speedy bass boat. It comes with everything you need to mount the unit, and it is also available in a self-contained portable unit perfect for ice fishing or use on a canoe or other small boat. Garmin’s Striker line of GPS depth finder combo devices lacks chartplotter functionality. If you are looking for a great fishfinder with all of the latest technology, but detailed charts aren’t crucial to you, these units are perfect. The Striker 4 comes with everything you need to start getting fish. A 3.5-inch screen may seem small at first, but Garmin does an excellent job of squeezing everything you need to see in and making it easy to use and easy to read. The Striker 4 is great if you are looking for a self-contained unit or you are short on space. Garmin’s Striker 4 is the perfect fish finder for mounting on a kayak. This five-inch fish finder combo offers a surprising amount of features in a small package. Humminbird’s Helix offers dual-beam and CHIRP technology along with all the charting options you might want for navigation. 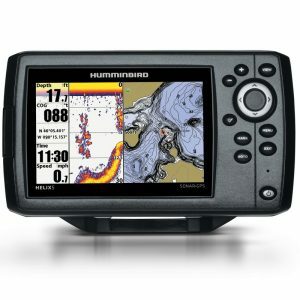 Humminbird has been at the forefront of fish finder combo units from the beginning. Continually innovating, the Helix series includes some of the best fishfinder GPS combo units on the market today. Humminbird’s best fishfinder GPS combo offers superb value to anglers looking to upgrade their onboard sonar. Very much like the Garmin CHIRP 53CV, this Humminbird combines charting and sonar perfectly. The screen is the perfect size for most boaters, and you couldn’t ask for a better set of features. Garmin’s Striker Plus 9SV is the largest of the Striker series. This unit doesn’t feature nautical charts, but still provides a nice, easy to read screen that you can see from a distance. Like the Striker 4, the Striker Plus 9SV is aimed squarely at anglers. 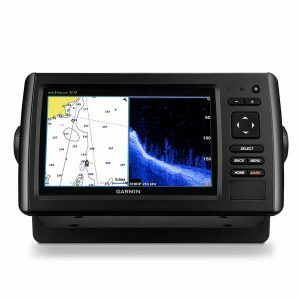 Garmin smartly eliminates the networking features and chart plotting features need on larger vessels to save you some dollars on these fishfinders. 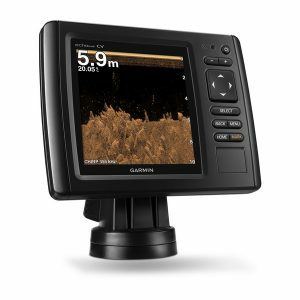 If you want a large-screen device for your boat and you want the latest sonar technologies, Garmin’s 9SV is one of the best units you can find. Available in four-, five-, and seven-inch versions, the Dragonfly Pro series from Raymarine is a fun fishing toy. 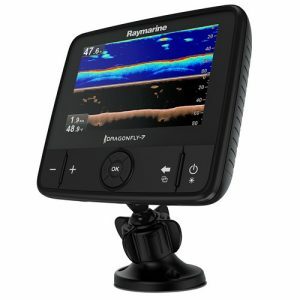 Raymarine by FLIR is an industry leader in marine electronics, from basic fishfinders to radars and multi-function displays. Their devices offer cutting edge technology, especially in the clarity of their sonar imagery. The Dragonfly Pro 7 is the best GPS fishfinder for the angler who’s a techie at heart. Connect the unit to the Raymarine Wi-Fish or Navionics cartography apps on your smartphone for a 21st-century fishing experience. If you’re looking to a sharp, modern design and the best deep-water fish finder, look no further than Raymarine’s Dragonfly series. 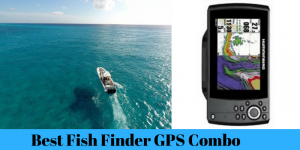 This fishfinder GPS combo from Simrad is modern and sleek looking and offers a lot of versatility to the angler. 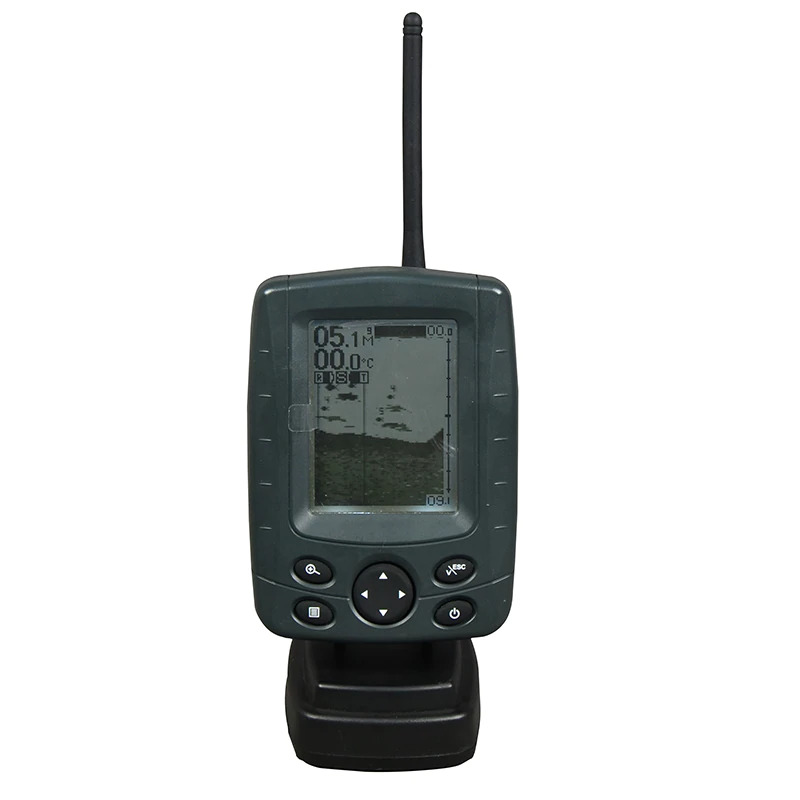 The GO7 is very similar to the NSS7 evo2, except that this GPS fishfinder combo lacks the hard keys and selection knob found on the former, making it a multi-touch only interface. While the GO7 is network compatible and can run radars, radios, and traffic systems, it can also run nearly any sonar unit you pair it with. This combo comes with a transom mounted CHIRP transducer that should keep you happily catching fish for years to come. 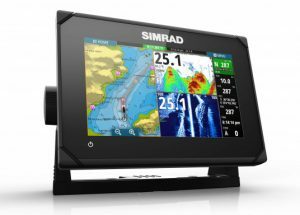 Simrad’s multi-function displays are bright and easy to read. Their large screens offer a lot of real estate for viewing fish and bottom contours. 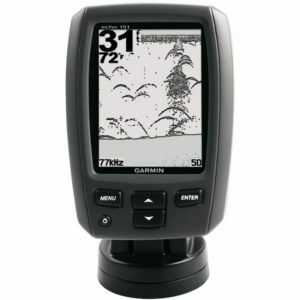 The CHIRP 73SV is a seven-inch version of Garmin’s echoMAP line of fishfinder with GPS combo units. 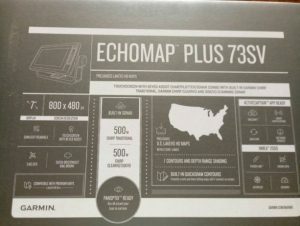 Unlike the echoMAP 73SV listed above, this unit is an older design that lacks the touchscreen. This unit has just the right mix of GPS chart plotting ability and sonar compatibility. Over NMEA2000, the unit will expand to “talk” to your AIS or other onboard systems, as well. Garmin’s 73SV is the best GPS combo unit for medium-sized boats on a budget, especially if you’re going to be working in coastal waters and want access to upgradeable maps. If all of these newfangled technologies are making your head spin, here are answers to the top questions you might have about fish finders, GPS, and sonar. A fishfinder is basically an underwater radar for boats. An ultrasonic beam is sent downwards through the water. That beam bounces off objects and returns to the boat. The display provides a visualization of what is under the water. It’s not a perfect picture, but general outlines and shapes can be determined, as well as the depth of objects. Anglers can use this to piece together a better idea of what they are looking for, be it structures that may hide fish or the fish themselves. What is a transducer on a fish finder? The transducer is the underwater component of the fish finder. It is mounted on the hull of the boat, either inside a through-hull mount or attached to the transom on a bracket. Transducers are sometimes packaged together with a GPS/Fishfinder combo, but you can usually upgrade to different technologies with a new transducer. Many manufacturers offer some newer technologies like forward-looking sonar and ultra high-resolution transducers. The transducer sends out ultrasonic beams. These beams strike the bottom and objects underwater, and then they bounce back towards the boat. The transducer receives the bounced back signals, and it sends this data back to the fishfinder display. Dual-beam transducers send out multiple beams with different cone angles, which allow them to cover more area. This enables technologies like side-scanning and forward-scanning sonar. The best transducers also feature a multiple frequency beam, like the newer CHIRP transducers that produce very high-quality images of the bottom. 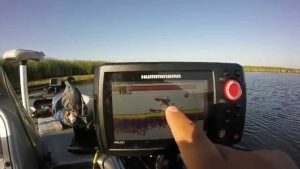 What is the Best Fishfinder GPS Combo? Picking the best fishfinder GPS combo depends on the sort of vessel you are installing it on. 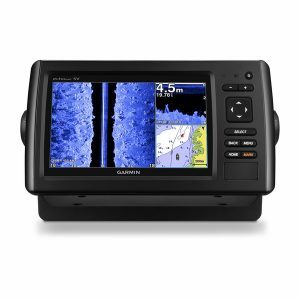 For most fishing boats from 15 to 30 feet long, our choice is the Garmin echoMAP Plus 73SV with CV52HW-TM transducer. 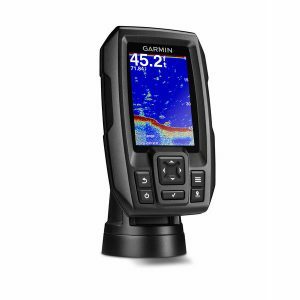 If you are looking for a smaller portable unit, consider the Garmin Striker 4 with Transducer, 3.5″ GPS Fishfinder. For larger boats with space to flush mount a beautiful and large display, look no further than the Simrad NSS7 evo2 Combo Multifunction Display Insight.